Welcome to your course or tour in Spain! 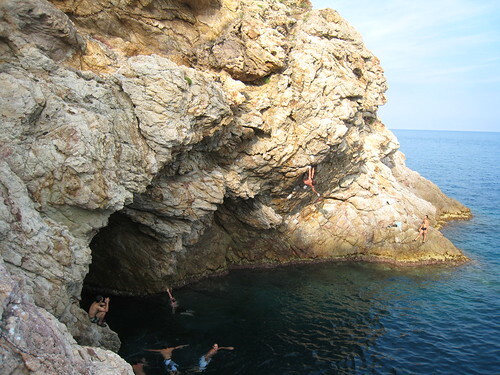 Just outside of the little coastal town of Tossa de Mar in Costa Brava, about 1½ hours north of Barcelona, some pretty fun Deep Water Solo/Psicobloc can be found. The rock is pretty grainy granite but with the closeness to water some of the holds are a little smother making it not too hard on your skin. There are only about 5 routes and they are not more than 10 meters high but for a day of fun it is for sure worth the effort to go there! My favourite is the excellent route La del Pako, 6b. Long and fun! Pere has made a nice video showing more or less what you can expect from a day in Tossa. He has also prepared a topo and a description on how to find the climbing once you have reached the parking. Here you can download the topo. So break away from your family vacation and get some adrenaline going! Tagged with costa brava, deep water solo, psicobloc. The pic shows the rest before the crux of all teh 4 routes of this mini wall. Glenn, try now and see if it works! I will also try and check out some other deep water solo spots this summer, will be great! TR said something about another route on this crag, that is not mentioned on the topo. Does anybody have the topo including also this (and maybe also some other) route? Hey is there a way to get up to Tossa from Barcelona? Im traveling in the country with my shoes and chalk bag, going through toldeo, seville, cadiz, barcelona and pamplona. only really able to deep water since I dont have a pad or partner (my traveling companion isnt so interested in climbing). Also, any tips on urban climbing/gyms? Thanks! is some info about that.